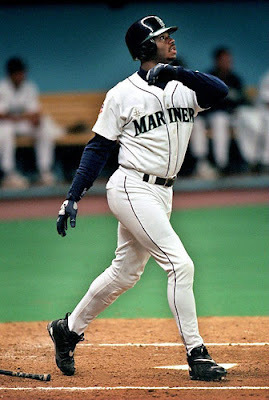 Once I found out that Ken Griffey Jr. had retired last night, I wanted to immediately take back what I had posted on this blog for the day and put up a hasty and overly emotional post praising the man. However, what I did instead was scroll through the initial blasts of praise for Ken Griffey Jr. and his career. How he was the one player from the last 20 years that you should relish having the opportunity to tell your grandchildren about. I let my initial urge to gush (no sexual innuendo) subside. I let my eyes focus on the fact that so far this season, Ken Griffey Jr.’s stats read: .184 BA, 0 HR, 7 RBI, 1 NAP. I let all this sink in along with the image of a slightly bloated, clearly 40 year old shape of Ken Griffey Jr. and stew overnight. What you are about to get after all of that clear headed and objective thinking is a post that will detail, in only the highest hyperbole, how great Ken Griffey Jr. was. I say Jerry Rice uneasily because he didn’t truly capture the imagination. What Jerry Rice captured and exhibited to perfection was what a terrific work ethic and discipline can accomplish. He was an overachiever and was the epitome of work ethic. We all know Michael Jordan’s excellence, my love for him and his firm entrenchment as the best athlete of all time. Barry Sanders was simply a freak of nature, a player in the Jim Brown, “too good and too smart to allow time to tarnish an image of them” mold. There will never be another Barry Sanders and there will never be another Michael Jordan. There will also never be another Ken Griffey Jr. He was a singular talent and athlete. He was on the opposite side of the spectrum from Jerry Rice in that he was not the epitome of work ethic. He was the poster boy for natural athleticism, superior speed and strength, and an effortless grace of playing a game – the game of baseball. He had the quality that certain athletes have that makes you think, “If I were to look up the definition of a [insert sport] player, who would the picture be of?” I am of the firm belief that for baseball it would be Ken Griffey Jr. He roamed centerfield like no one ever had. He made people forget Willie Mays. He flew. He crashed into walls; he scaled walls. His swing was perfect. Maybe it wasn’t mechanically perfect, but it looked perfect and it felt perfect. You would see Ken Griffey Junior standing at the plate, nearly straight upright, that white or grey Mariners jersey matched with the navy helmet and the revamped, classic looking silver Seattle “S.” He’d hold the bat almost limply against his back shoulder. Then, the pitch would come in and Griffey would swing the bat like a golf club and make the ball soar. It soared through the Kingdome; it soared through Kansas City, through Baltimore, and through New York. 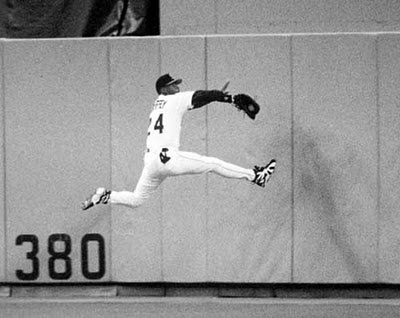 And as it soared, you thought that Griffey was the only player who could catch his own pop fly because he was so fast. He stole bases; he won ten Golden Gloves in centerfield, etching himself as perhaps the archetypal centerfielder in Major League Baseball history (and perhaps edging out Willie Mays Hayes in sports fiction as well). There were extenuating circumstances that made him seem larger than life. There was the fact that for his first two seasons in the league he played on the same team with his own father. He was the only baseball player in the 1990’s to have an ad campaign that even approached those that were put on by Michael Jordan and other NBA players. He was so good, so beloved by kids and baseball fans everywhere, that in Little Big League he could even pull off a turn as the bad guy when he single-handed beat the Minnesota Twins in a one game playoff by hitting a deep homer and then robbing Lou Collins of a home run in the bottom of the ninth, breaking the heart of Minnesota and manager Billy Heywood. There was the classic Ken Griffey Junior SNES game that featured no real MLB players besides Ken Griffey Junior. He was handsome, he looked cool, and there was just a natural easiness to him that was never surpassed by any other big slugger of the 1990’s or the 2000’s. Four different presidents took office during Ken Griffey Jr.’s career in the MLB. He was the Paul Newman of sports. However, he was not perfect. His decision to go to Cincinnati was ill fated. It was seen as a classy move since his father played for Cincinnati and Ken Griffey Jr . was raised in Cincinnati, but really it was a move of slight cowardice and greed. Cincinnati threw more money at Griffey, so he left. However, his Seattle teams had consistently performed well in the regular season but always underachieved in the playoffs. The 1997 and 1999 Mariners were certainly as talented if not more talented than the Yankees in 1999 and both the Indians and the Marlins who faced off in the 1997 World Series. It would have elevated his legacy if he had stayed in Seattle and finished the job he started. 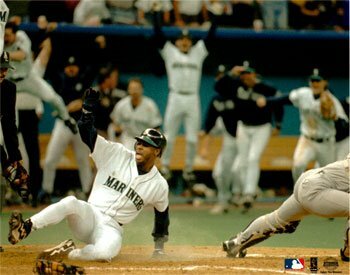 Perhaps the one postseason highlight he had was the slide against the Yankees in 1995, which kept the Mariners in Seattle. That was certainly one of the best games in baseball history and of course you had to assume that Ken Griffey Junior would be a part of it. His natural grace and athleticism also got the best of him and caused him to miss a large portion of his prime due to injury. Ken Griffey Jr. was notorious for not stretching. He was so in tune with the game that he never thought he would need to. Griffey once said, “Why should I stretch? Does a cheetah stretch before it chases his pray?” How insane does that sound? Pretty crazy, right? But that is how good Ken Griffey Jr. was. You did not question him comparing himself to the fastest land animal on Earth. His instinct and ability to play the game of baseball were no natural and so impressive, that you never expected him to slow down or ever get injured. Yet, that is what happened in Cincinnati. Each year you were expecting him to come back and show his old form. And each year he would either get injured in spring training or hit almost 20 HR through June and then be put on the DL until the end of August. He would hit a few HRs and then be done for the season after the second week of September. It became like clockwork. It was frustrating and it was sad. It goes to show how valuable a player like Jerry Rice is and how valuable a work ethic can be. Jerry Rice was not as physically gifted like Ken Griffey Jr. was, but he worked harder than anyone in football and he had a long career where he set basically every receiving and almost every offensive record in football. Griffey could have done the same thing. Even missing almost five seasons with injury, he finished his career with 630 home runs. Who knows what would have happened had he just considered stretching; had he just thought for a moment that he might get old and his once in a generation natural ability might wear out at some point? Maybe Barry Bonds wouldn’t have garnered so much attention; maybe we would feel a little better about the steroids reality. 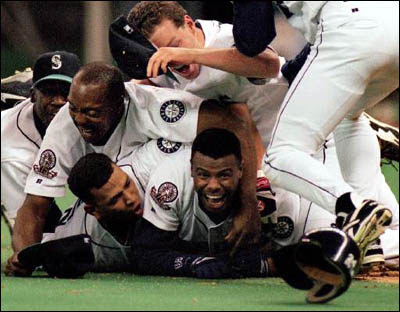 However, we’ll never know, because Ken Griffey Jr. didn’t want to stretch. We will always look back fondly on Ken Griffey Jr. because he never took steroids. I am convinced that he never took steroids and that we will never find out after the fact that he did. He was a slugger in the most corrupt era of baseball and put up numbers alongside McGwire, Sosa and Bonds without cheating. He was the best baseball player of his era without using steroids. And in the end, who cares about steroids anyway? We all wanted the home run frenzy and it serves us right that we now have to deal with the fact that the larger than life heroes we craved so much, were in fact larger than life. We look for heroes when we need them and then tear them down as soon as we realize the measures they took in order to help fulfill our dreams. In the midst of all this steroids, Barry Bonds, Mark McGwire and Sammy Sosa aren’t even relevant anyway, because we are going to remember Ken Griffey Jr. more than all three of those guys anyway. Americans love natural ability, they love transcendence and that’s what Ken Griffey Junior was above everything, he was transcendent. Obviously, I love Ken Griffey Jr. I watched him as a child. I drew pictures of him. I wore a backwards, teal Mariners cap to school. I always wanted to be Ken Griffey Jr. when I played home run derby with my friends. I am a grown man now (at least I pretend to be) and I have grown past truly idolizing sports figures. I’ve seen Michael Jordan, Jerry Rice, Emmit Smith, Joe Montana, Steve Young and all of the other sports heroes of my youth retire and turn into the grey and tan blazers of middle and old age. However, saying goodbye to Ken Griffey Jr. still contains some kind of meaning to me. It signals the evaporation of the last drop of childlike wonder I had towards sports. I still look for those moments of wonder, the players that inspire wonder (Dwyane Wade) and I can acknowledge where it is. And that’s what matters to me now. Ken Griffey Jr., as much of a shadow of himself as he was, still stood as the last vestige of a virtue of wonder that I still hope that kids have for sports and for athletes even if they know they take steroids. Rock n’ roll bands are for “can do” attitude, but athletes like Ken Griffey Jr. were put on earth for the, “I could never do that” attitude. And sometimes we need people like that. We need that ability to wonder, we need a hero that we can build up and who won’t be pulled down so easily. Perhaps Ken Griffey Jr. can’t be pulled down so easily because he made it look so easy and because baseball and being an idol were part of his DNA. Or perhaps it was because he never reached the heights that we always expected he would. Ken Griffey Jr. hit 630 home runs in his career. He spent 22 years in Major League Baseball. I am 24 years old. Ken Griffey Jr. has been my life. Knowing that there was someone so natural out there always made me want to strive harder in the world to do better, to find my natural grace with whatever talents I have. 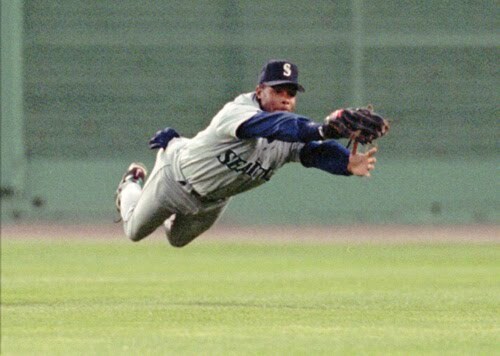 I will still strive do that even though Griffey is gone. And I find it funny that Griffey leaves baseball and effectively closes the book on my child heroes in sports right after a weekend where I visited a friend who is in many ways closing the book on being the same childhood friend I grew up with. He will be the same person – that is for certain – but he has bought a house, he has gotten engaged and he has entered a new phase of his life. Sometimes your heroes seem like your friends and sometimes your friends are your heroes. In any case, Ken Griffey Jr. and my friend are both moving into different phases of their lives. I think it may be time for me to strive to do the same. I’m glad there are people like them out there.